If you were to search the Internet for Autoresponder Email Software you would find company after company trying to pass off the same old, run-of-the-mill autoresponder system as their own high-tech autoresponder software. The truth however is, they're all selling the same old out-dated autoresponder email systems. Yes, their autoresponder systems can send a series of autoresponder email messages, they can accept subscriptions, and some of the more sophisticated ones can handle things like HTML email. However their autoresponder software features are simply the basic bare minimum every Internet Marketer and online business needs to only just get by. If you want to really sky-rocket your email response in this competitive marketplace you need more powerful features to make your emails stand out from the rest of your prospects flood of daily email messages. 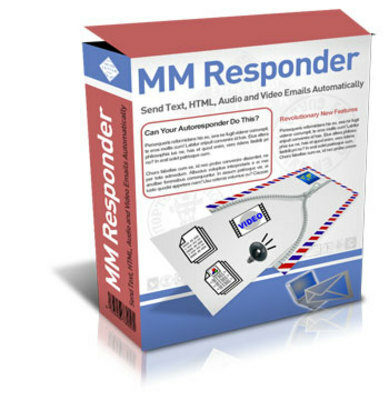 MM Responders is a software script that runs on your web site, which enables you to setup and automatically send Unlimited Multi Media Autoresponder emails, Unlimited Multi Media follow ups, Unlimited Multi Media broadcasts and Unlimited Multi Media campaigns. Please don't mistake MM Responders Software as any run-of-the-mill email autoresponder. MM Responders Software does things no other autoresponder on the market does. Multi Media Product Announcement Emails - Increase your orders with new product announcements by using Video Email to sell and demonstrate the product in action. If you are selling a product as an affiliate you will stand out from the crowd while all the others use the standard text email that is normally provided by the affiliate company. Order Confirmation Video Emails - Thank your customers for their order with a follow-up Video Email. This gives them reassurance and the feeling of a more personal service, reducing refund requests. Customer Support Emails - Cut down on customer service resources. Instead of telling your customers how to do something complex using a number of text emails, show them with one Video Email. Reduces confusion, we all know it is much easier to do something if we are shown how to do it. Multi Media Autoresponder Courses - Instead of letting people read your lessons, let them hear or watch them. A multi media autoresponder course immediately creates the impression of higher value than a plain text course, even if it contains same content. Multi Media Email Newsletter - Make your ezine newsletter come to life. Using audio commentary and/or video to promote new ideas to subscribers. Video / Audio Testimonials - Imagine the massive impact your sales will generate with your customer testimonials on video / audio. The effect of multi media email testimonials have over plain text testimonials is astonishing. They add pure realism and support to your offers. The possibilities of using multi media emails are truly unlimited! All this is possible and much, much more with MM Responders Software. Multi Media Emails immediately grabs your prospects attention. A recent study found that emails that used multi media more than tripled conversions over plain text emails. According to Forrester Research "Multi media email will replace text email messages as the online communications mechanism. Text-based email will seem as archaic as black and white television." However, presently a very small percentage of people have their computer set to not receive HTML and Audio / Video Emails, so we have added a powerful feature to MM Responders Software called Automatic Email Format Detector, which automatically combines several email message formats together in a single email message - Plain Text, HTML, Audio / Video and AOL Optimized Plain Text. MM Responders Software automatically detects what email format a reader can receive and then delivers it to them. Those that can receive HTML, Audio / Video, then it will be delivered automatically to them. When only Plain Text can be read, only Plain Text is delivered. When the email message is sent to an AOL user and they can't receive HTML, Audio / Video, then the Plain Text email message is automatically optimized and delivered with properly formatted hyperlinks that AOL users can read and click. Professional, autoresponder addresses are [email protected]://www.tradebit.com for professionalism. Unlimited Autoresponders Unlimited Multi Media campaigns, Unlimited Multi Media follow ups, Unlimited Multi Media broadcasts. Audio / Video Autoresponder Email Content Upload unlimited multi media audio / video - which will play automatically when the reader opens your multi media autoresponder email message. Automatic Email Format Detector Automatically combine several message formats together in a single autoresponder email message: Plain Text, HTML Audio / Video and AOL Optimized Plain Text. Multi Media Autoresponders software automatically detects which email format a reader can receive and then delivers it to them. Confirmed Opt-in You may switch your autoresponders to opt-in mode, so that your subscribers must confirm their intention to subscribe before they are added. With the CAN SPAM Law, you need all the protection you can get! (If you transfer a list from another autoresponder service or software - your list does not have to click a confirm link again, as you can switch the opt-in mode off while you transfer / import your existing list). Spam Complaints Protection IP address and subscription date / time recorded for all form-based subscriptions. Emailed subscriptions have their email header records stored for each subscriber and can be emailed to subscriber as proof of subscription. Test Autoresponder Email Messages Test your autoresponders by sending all saved messages instantly to an email address of your choice, so that you don't have to wait days before all follow-ups are delivered. Manual Broadcast Broadcast an email ('a manual follow-up') to your mailing list; you can use this to announce new products, notify your prospects about special offers etc. Broadcasting To Multiple Lists Broadcast a single email across multiple lists in one go, with automatic exclusion of duplicate subscribers so each only gets one copy of the email message. HTML Form Generator Copy and place generated HTML code on your website, which will automatically add prospects to your autoresponder. Includes an option for "multiple choice subscriptions" to accept subscriptions to multiple autoresponders on one form. Automatic Capitalization of your subscriber's name when they complete your subscription form. Customization of your subscriber-facing web pages such as subscription confirmation pages. Powerful Tracking Features Helps you determine where your prospects came from. Active Prospects Lists Edit/remove all active prospects (people who have triggered your autoresponder recently and are in your autoresponder cycle, waiting for all follow-ups to be delivered), you may also add more prospects manually. Mailing List Shows your mailing list (all people who have triggered your autoresponder in the past, not just the active prospects); you can edit/remove/import entries. Undeliverables Views a list of emails that were rejected ('bounced-back') by the email system, because for example your prospective customer changed their email address. Removals Shows a list of email addresses of people who removed themselves from your autoresponder. Users Online Help Guide Step-By-Step Instructions to guide you, meaning that the answers to the most commonly asked questions about the functions of Multi Media Autoresponders software are never more than a click away.